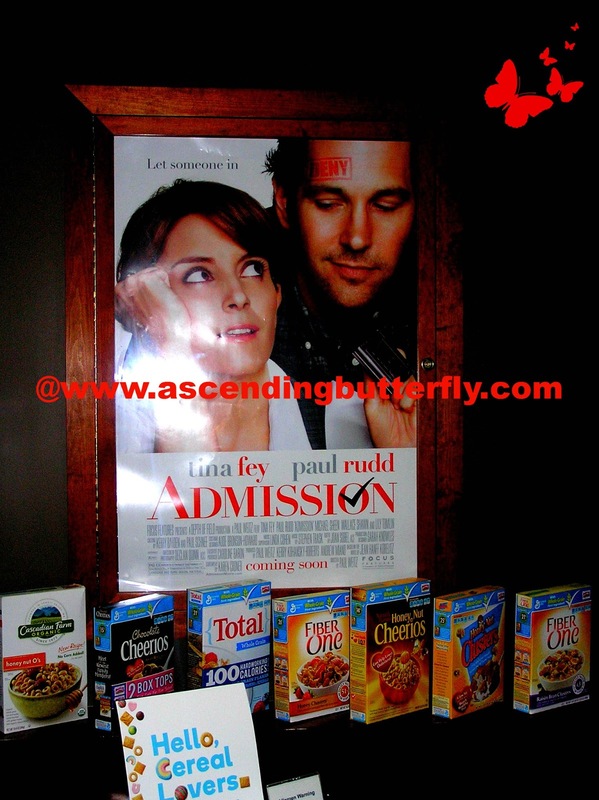 Admission Theatrical Poster and vignette of General Mills Cereals - Hello Cereal Lovers! March is certainly a busy month, and I keep finding fun facts for the month of March, did you know that today is National Cereal Day? How many mornings do you get to spend with Movie Directors, Celebs, Mimosas (aka MOMosa's for those in the know) and combine them with creative cereal pairings? Morning MOMosa anyone? Just another Tuesday morning for us bloggers in New York City! And then we were offered some pretty unique eats to pair with our signature MARTINI Wines 'MOMosa's', CEREAL! 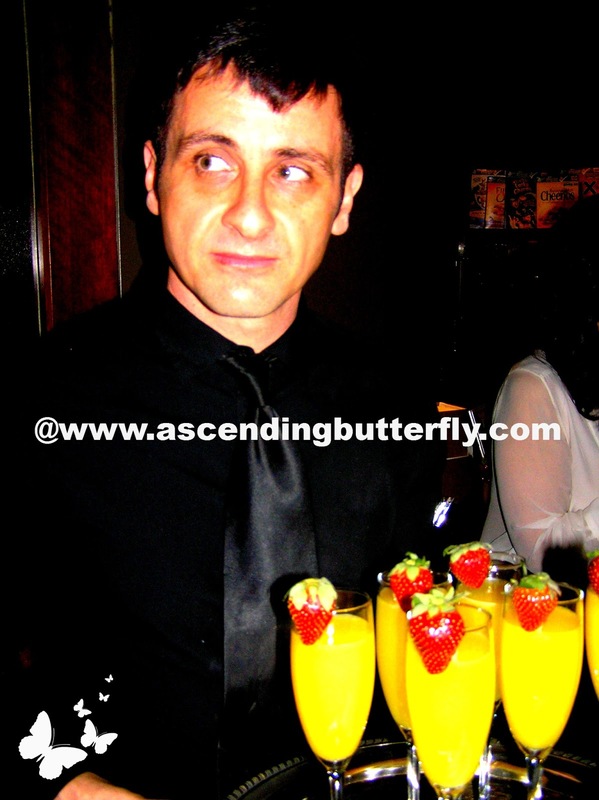 I don't know about you butterfly, but I had never paired my cereal with Sparkling Wine and OJ before! Have you? 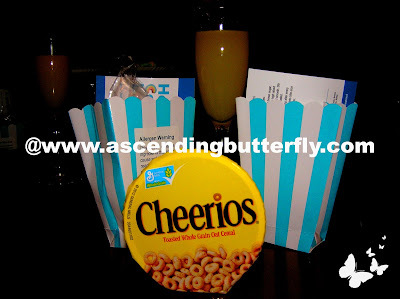 And even once we were seated cereal was delivered directly to us at our seats! Your pick of General Mills Cereal delivered directly to your chair! I thought it was super creative, and so you know I had to make a cute little vignette and get a shot of it all before I dove in! Now this is the way to put together a Movie Screening! If only all of them were this creative, fun and organized! Thankfully the pros got good shots! Doesn't Tina look awesome in her blue wrap dress? 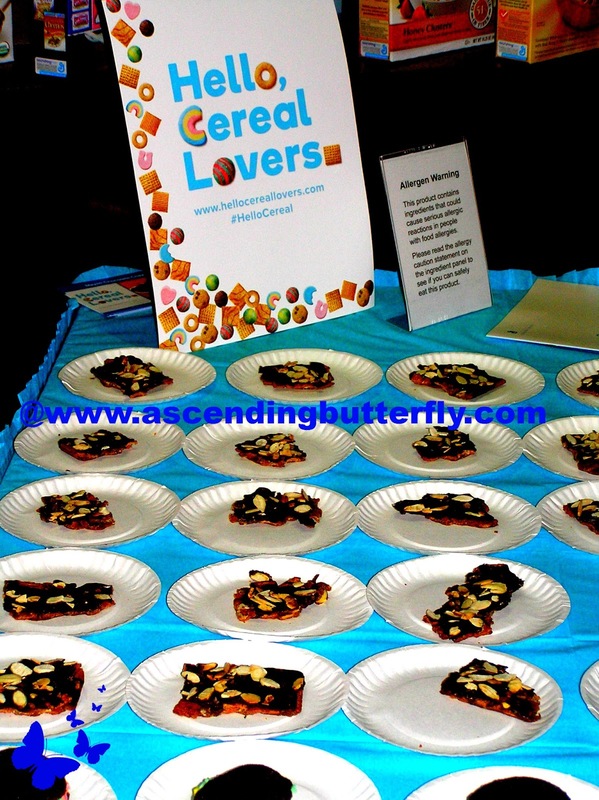 Event Sponsors MARTINI Wines, Hello Cereal Lovers, The Moms and Focus Features Admission put together one very enjoyable movie screening! This event was actually featured recently by Perez Hilton, because you know, that's how I roll, Page Six here I come! 2. In 2-cup microwavable measuring cup, microwave brown sugar, butter, corn syrup, chili and red pepper uncovered on high about 1 1/2 minutes, stirring after 1 minute, until melted and smooth. Stir in Vanilla. Pour over Cereal mixture; stir until evenly coated. 3. Microwave uncovered on high 5 to 6 minutes, stirring after every minute. Spread on waxed paper or foil to cool. 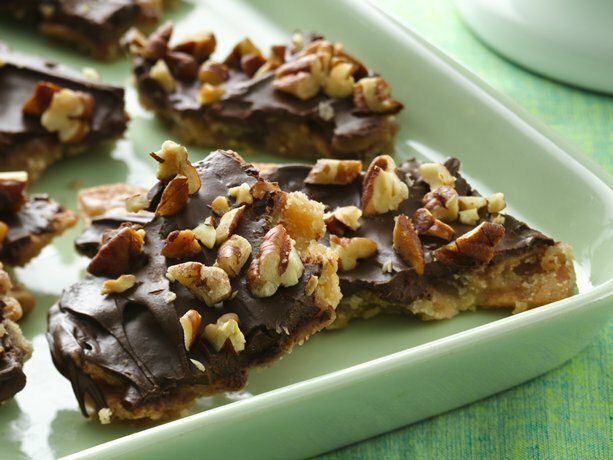 Break into bite-size pieces; stir in chocolate chips. Store in airtight container. Tips: Pecan Halves can be used in place of the Cashews! 1Preheat oven to 350°F. Line two cookie sheets with parchment paper. 2In a large mixing bowl, beat cake mix, water, oil, and eggs on medium speed for 2 minutes, scraping bowl occasionally. 3On a parchment lined baking sheet, drop heaping tablespoons of cake batter two inches apart. 4Bake for 8 to 10 minutes or until toothpick comes out clean in the center of a cake. 5Allow cakes to cool on parchment for 10 minutes on a wire rack. 6In medium bowl, beat shortening and butter with electric mixer on high speed 3 minutes. 7Reduce speed to low and add granulated sugar, mint extract, food color and milk. 8Add powdered sugar 1/2 cup at a time until smooth. 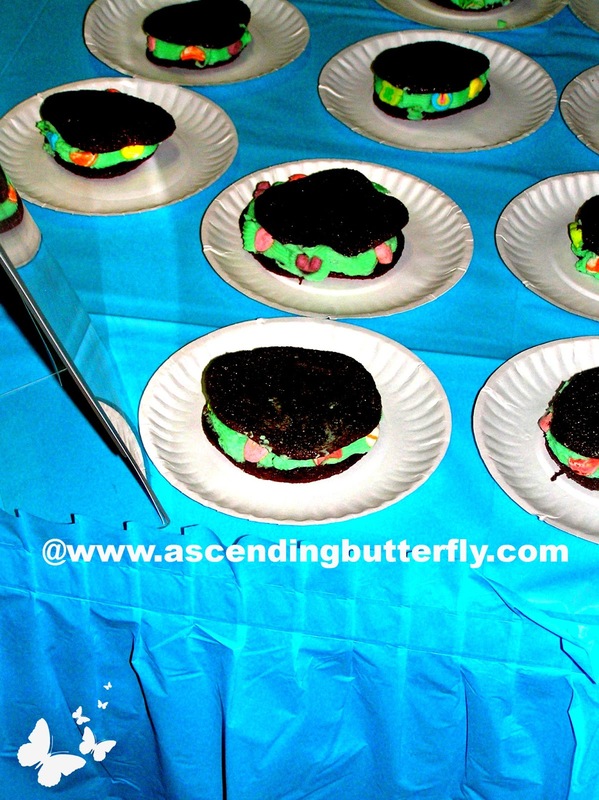 9Spread a small spoonful of mint frosting between two cakes and decorate the edges with Lucky Charms® marshmallows. 2Line 15x10x1-inch pan with heavy-duty foil. Spray foil with cooking spray. Spread cereal evenly in pan. 3In 2-quart saucepan, heat butter and brown sugar. Using whisk, mix butter and brown sugar together as butter melts. Heat to boiling over medium-high heat, stirring occasionally. Reduce heat to medium. Boil 2 minutes without stirring. Immediately pour mixture evenly over cereal in pan. 4Bake 12 minutes. Sprinkle chocolate chips on top. Let stand 5 minutes. Spread melted chocolate; top with pecans. Cool completely, about 1 hour. Refrigerate 20 minutes to set chocolate; break into pieces. Store covered in refrigerator up to one week. The Official Website sums this film up perfectly - It's about the surprising detours we encounter on the road to happiness. My friends it really is about the journey, it just takes some of us longer than others to realize it. There are also great lessons about learning when to let go in this movie. We sometimes hold on to things that no longer serve our higher purpose, and while it seems difficult, sometimes you really have to close a door forever for the better one to open. And as always, Lily Tomlin is BRILLIANT! Gloria Reuben also does a perfect job playing that office back-stabbing rival that we all will end up confronting at some time or another! 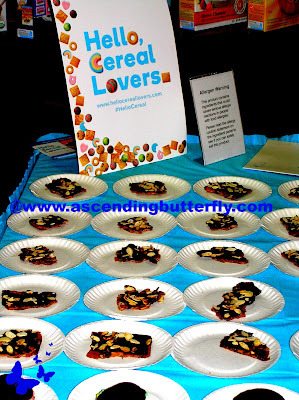 It was also fun learning some creative ways to use cereal in recipes and mix it up a bit! Butterflies once you've had a chance to check out this film, please come back here and let us know what you thought! And don't forget to tell us which Cereal you rang in National Cereal Day with! All the treats look wonderful. I love Tina's dress. @JDaniel4's Mom - The treats were a sweet sugar rush and the MOMosa's totally added to the fun! Isn't that dress awesome? I love the wrap style and that pop of cobalt blue color is phenomenal on her! Cool way to see a movie, I'm a cheerios and banana girl myself. Those treats look yummy think I'll try my hand at making some. @Big Happy Buddha - Definitely a GREAT way to see a movie! Let me know how you liked the cereal recipes! 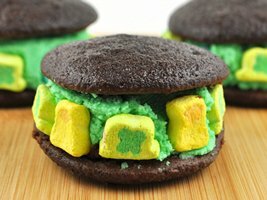 The Whoopie Pies were my favorite, and they are so perfect for St. Patty's Day too! I love Tine Fey & am Paul Rudd movies!! I can't wait to see them teamed up.Plus we're a HUGE cereal family. My son's nickname is "cereal boy"!! Looks like a very fun event!! Delicious! I'm watching my son eat mini wheats right now!